What has been billed the largest scandal in the history of the organic industry has now resulted in a court settlement on behalf of consumers against Aurora Dairy, a giant factory-farm operator with industrial-scale operations in Colorado and Texas. Aurora has agreed to pay plaintiffs in a class-action consumer fraud lawsuit $7.5 million to end litigation involving fraudulent marketing claims concerning organic milk. Aurora and its major customers — supermarket chains selling private-label organic milk, including Pleasanton-based Safeway — were accused of misrepresenting the authenticity of their products. 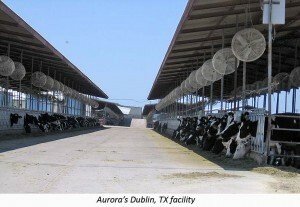 An Aurora factory farm in Texas. Aurora, based in Boulder, Colorado, first gained notoriety in 2005 when The Cornucopia Institute, a farm policy research group that acts as an organic industry watchdog, filed a formal legal complaint with the USDA alleging that it was producing its milk on giant feedlots, confining as many as 4,400 milk cows, instead of grazing their cattle, as federal organic standards require. Cornucopia’s first complaint was summarily dismissed by Bush administration political appointees at the USDA. A second complaint was eventually adjudicated by federal regulators finding that not only had Aurora “willfully” violated regulations requiring pasture for their animals but it also used non-organic subcontractors and illegally brought conventional cows into their organic operations. “Even after the USDA found that Aurora had ‘willfully’ violated 14 tenets of the organic standards this company, with over $100 million in revenue, was allowed to continue in operation, without a cent of fines,” said Mark A. Kastel, Senior Farm Policy Analyst at the Wisconsin-based Cornucopia Institute. Because of the multitude of problems found at Aurora, one of the violations documented by the USDA was selling milk that did not meet the federal organic standards. The class action lawsuit, originally consolidated in the St. Louis federal district court, was brought on behalf of consumers in more than thirty states who felt defrauded after purchasing private-label, or store brand, organic milk at a number of retailers that Aurora specialized in serving, including Walmart, Costco, Target, Safeway, and other large grocery chains. After the USDA sent a proposed letter of revocation to Aurora, in 2007, they retained William J. Friedman, of the powerful Washington law firm of Covington and Burling, to represent them in the matter. Friedman brokered a deal with Bush administration officials at the USDA to allow Aurora to operate under a one-year probation and make a number of changes to their operations. The number of milk cows at their Platteville, Colorado facility, as one condition, was reduced from approximately 4,400 to 800. This herd size could be legally managed on available pasture. “Congress gave the USDA the authority to fine scofflaws, in matters like the Aurora scandal, millions of dollars, and yank their organic certificate, effectively banning them from commerce, but they chose to side with the millionaires and investors operating Aurora rather than the thousands of family-scale dairy farmers that they had competitively injured,” said Tony Azevedo, President of the Western Organic Dairy Producers Alliance. Aurora, and other giant factory farm operators, including the dairy giant Dean Foods, which owns the Horizon label, are accused of bringing so much organic milk into the marketplace that they have suppressed pricing for family-scale organic dairy producers forcing some out of business. The class action lawsuit, and subsequent settlement, centered on labeling, graphics and marketing claims depicting cows happily grazing on lush pasture, and in some cases family-farm scenes, when in reality the animals were living short, stressful lives being forced to produce copious quantities of milk in the kind of filthy industrial conditions that organic consumers thought they were avoiding. “In every market dedicated organic consumers can find brands of organic milk, cheese, butter and ice cream, that truly represent superior environmental stewardship, humane animal husbandry — and where the profits are more equitably shared with hard-working farm families,” Azevedo added. If a federal court in St. Louis approves the settlement agreement, consumers can get $10 rebates without a receipt and up to $30 with receipts. A planned website will explain how to file for rebates according to an Aurora spokesperson.